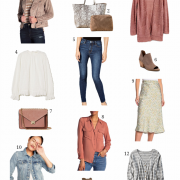 Every month when I put together SUT, I always try to come up with new combinations – sometimes I put together two complete outfits and other times it’s just a random mix of seasonally-appropriate items. For May, I decided to focus on blouses & skirts – mainly because I tend to wear more skirts & dresses this time of year due to the fact that they are cooler & less restricting than jeans or trousers. Below I’ve put together 3 different looks…whether your style is more edgy, feminine or classic, there is something here for everyone! All three are cute but #1 is my fave. Although I do LOVE those shoes in look #2!!! Great finds! I am in love with the second outfit!! Cant believe how inexpensive all of these items are! Great picks! The third look is my favorite. If I can get 30 minutes to myself (the life of a mom!) I am going to do some online shopping. I love when you do these roundup of ways to dress for different occasions…LOVE these picks! I would definitely wear the work look, can't believe that skirt is F21! Love all three outfits but I really love #1!!! I just love the weekend look! Cannot believe those cute little flats are from Forever 21! I enjoy the Steals Under $30 posts, no matter how you format them. There is at least one thing in every outfit that I wouldn't mind having. Especially those metallic sandals in the weekend look. kw, ladies in navy giveaway on the blog! I love all of these looks, especially the weekend one. The yellow skirt is gorgeous! Great post! Love the weekend outfit! I love all of these, so cute! But #1 is most definitely my fav! Love that top! I always love this series, but this is one of my favorites so far! I hope to be buying the skirt from Look #1 and the shirt from #2 TODAY! Love them! You know I'm always in favor of a great deal! Under $30? I can totally handle that! 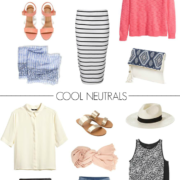 Loving all these outfits…especially those metallic F21 flats! Love these picks and what great prices. I can't believe the prices of the skirts. Thanks for sharing. If you get a sec, please check out my latest post 'Bonjour'. I would love to read what you think of it. I love all of these! I need to completely revamp my wardrobe now that it's my first summer somewhere hot…but I've been holding off due to costs. Thanks for sharing! These are such great deals! I like all of them but #1 is my fav- adore that skirt! Loving all of these finds! love the picks! loving your TJMaxx feature girl! I love every single one of these. I especially love the third since it's perfect for work and I'm always trying to find ways to spruce up my work attire. I just came across your blog today and it's great! Would you like to follow each other on GFC and Bloglovin? Love the skirt from the work outfit, great pattern! My favorite looks are #1 and #2! I think any format of SUT is great as they all showcase pieces anyone can afford! I'm loving everything about that for work outfit! That top is awesome! I like how you built outfits this time! Loving the first skirt…great color combinations!! Loving the three outfits. And I really prefer when you do choose outfits, because that give to us an idea and how to put our own outfits together. My favorites are 1 and 2. Keep the good work. Thanks for all your hard work. those are fun flats! great outfit combos! Great picks! I love the work outfit!! Thats a lot of really great finds! I really like the "work" look. And the skirt in the "going out" outfit.